During regular business hours, City Hall is visited by residents for personal needs such as public services, city assistance, paying taxes and fees, applying for permits and licenses, and getting copies of birth, marriage, and death certificates. City Hall is also where commercial businesses, private and public companies, builders, contractors, and architects come to file building plans and to apply for city permits, approvals, licenses, and special variances and waivers. It is understandable that these personal and business visits are brief, and that individuals walking quickly down the main hallway between City Hall’s entrance and the new offices of the Department of Public Health and Department of Veterans Services may not realize that they have walked past one of Newton’s hidden gems – a small museum memorializing military service rendered by Newton residents to our country during times of war. “… in no part of the entire United States are there any action models which compare with the four realistic and spirited miniature models of scenes from America’s past wars which are placed there in deep recesses of the walls flanked by trophy cases which tie in with the models by of the scenes they depict … Into the creation of these four battle scenes has gone, not only a year’s artistry effort, but also painstaking research which included the close study of records in the libraries of Boston and New York, and in the Navy and Marine Corps Departments’ in Washington. In addition, it included a study of the Constitution herself and visits to the historic sites of Valley Forge and Gettysburg. Guernsey and Pitman also created three spectacular dioramas depicting the campus of Harvard College as it was in 1677, 1775, and 1936. They were initially displayed in Harvard’s Widener Library from 1947 to 2004. It took more than eight years to construct the first diorama with its precise measurements of the University campus, intricate urban details, bridges, boathouses, buildings, residences, streets, parks, subway, electric buses, and the natural landscape of Cambridge, including the Charles River, in 1936. Each of these municipalities is truly fortunate to have one Guernsey and Pitman historical diorama. However, the City of Newton has four. They are unique, accurate depictions of historical events, and priceless works of art that are deserving of, and in fact demand, rehabilitation by a conservator. Moreover, display items are presented without any coherent structure and – in most cases – without any description or identification. Some areas of the museum, such as the staircase and wrap around walkway, have been left unpainted or have peeling paint, and in places are used for storage of tables, chairs, ladders and other unrelated items. The lighting is inadequate and ineffective compared to today’s technology. In short, the museum, once the pride of Newton, has become a dark, dingy, confusing place. Another issue to address is that, because the War Memorial was dedicated and opened to the public well before the start of Europe’s Second World War and America’s Pacific War, the museum has no displays that provide a historical accounting of Newton’s involvement in the Second World War, the Pacific War, the Korean War, the Vietnam War, and the more recent wars in Iraq and Afghanistan. Its displays cover America’s military involvements from the American Revolution to the Armistice at the conclusion of the Great War. Since 1932, veterans’ associations and organizations, City officials, and residents have created public memorials to remember those who gave their all for this country, including MIA/POWs, in these and the subsequent wars of Korea and Vietnam by monuments erected outside City Hall and throughout the City in numerous villages, but not within the memorial museum. Now, in 2018, many Newton residents feel it is time to bring the memorial museum into the 21st century. No one will argue the fact that City Hall itself is in need of repairs and updating, primarily in the areas of heating, cooling, lighting, windows, and painting. But the small area on the first and second floors that constitute the War Memorial Museum must be attended to first. It is a small price to pay for a promise that has been given. As a city, we owe our veterans of yesterday and today nothing less than that. A small group of volunteers is currently in the process of developing a plan to spruce up the memorial area. Phase one of the project will be led by Newton North High School student and Eagle Scout candidate Angelo Visciano and will involve cleaning and painting the common areas as well as creating an inventory documenting all of the exhibits and artifacts owned by the City. Higher quality, museum appropriate lighting will be needed to replace the lighting installed in 1932. Decisions on the color of paint and the painting of the displays must be made. Perhaps a small area to sit and rest comfortably could be added. Updating the museum space will make it more welcoming to the public, who we hope will be attracted to this space displaying Newton’s history where they can learn, remember, or contemplate. 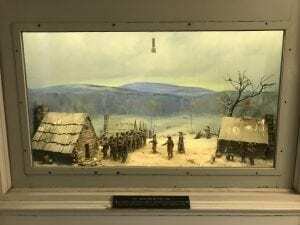 The second phase of the project will involve restorative work to the dioramas, in particular the Valley Forge display. Newton resident David Hoover, historical advisor on the this project, will assist in overseeing restoration of the dioramas. Mr. Hoover has a tremendous amount of research material on the history of the events depicted in the four battle scenes, as well as an unusual collection of material on the lives, both personal and professional, of Mr. Guernsey and Mr. Pitman, and their artistry in the form of historical displays. He will also expand on, or add new, historical information from a local perspective to the displays. Councilors Jake Auchincloss and James Cote – along with Public Buildings Commissioner Josh Morse and City Clerk David Olsen – have been instrumental in getting the funding together for the first phase. Additional resources will be necessary to support the second phase. Please watch this space, and let us know if you (or someone you know who may not read this post) are able to assist in this project in any way. (1) Ira Jacknis, “Doing the History of Anthropology as the History of Visual Representation”, History of Anthropology Newsletter 40 (2016): http://histanthro.org/notes/doing-the-history-of-anthropology/. Eric Aldrich, “Stepping into the past” January 12, 2016; https://www.ledgertranscript.com/Archives/2015/11/GfAldrich-ml-112715-3.aspx. 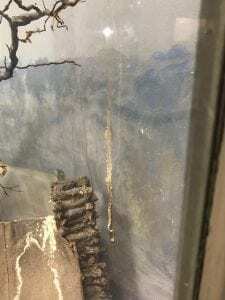 (2) Sean Fisher, “Report Regarding the History of Three Interpretive Dioramas Depicting Events of the 1775 Battles of Lexington and Concord Owned by the Metropolitan District Commission,” March 2003. This sounds like an excellent project. Have they found a professional to do the art restoration work? Is there any chance the city can take donations towards this worthy project? Thanks Chris and David for bringing this to our attention! Thank you both. We are still relatively early in the process so…. @Meredith – not yet. We need to get a better handle on exactly what is needed and then go seek. @Bryan – the City has put aside money for the initial clean up and paint for the non-diorama space. For the dioramas will are thinking that might be funded by a combination of city, CPA, and donation money, but we need to get the budget together. The team is meeting up again next Thursday and we should have more to report then. 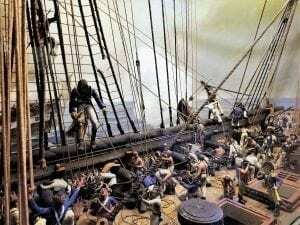 If the dioramas are considered historical, can the restoration qualify for CPA project funding? I took my fifth graders on a tour of City Hall for a number of years. The dioramas were always a great hit and we’d have to drag the students away. It’s too bad that they placed in a distant part of the building that no one would ever go to unless it was a destination. So happy to hear that they are receiving this attention and an restoration. I had no idea these cool dioramas are in city hall! This is a great, and much needed project. Good luck to all involved! When the restoration is completed, I would suggest that a different location be researched for the museum, for example, the new Senior / Center for Active Living or over at the Post where the Veterans meet and socialize, or a new development in one of the future projects on Needham Street, Newtonville/Austin Street, or Washington Street. Parking at City Hall is very difficult, and it would be an attractive option to relocate the wonders of the War Memorial artifacts and memorabilia to a location that is easily accessible. Is the Jackson Museum a consideration? I am at City Hall twice weekly, the parking is very bad, the goose poop is disgusting, and without a big public relations campaign, very few people know that the exhibits are there. @Chris. You beat me to the punch on this. I often visit this part of City Hall and I had also thinking to write an article on these fascinating and priceless memorials and displays. Your description of what’s there and the planned restoration efforts were beautifully crafted and methodically presented. I’ve always been pleased that a good part of the display involves Newton’s contribution in World War I. Too many displays and memorials give short shrift to this conflict. Joanne and I were planning to go to France this October to visit Dad’s battlefields on the 100th anniversary of the 1918 Armistice. But it was difficult to get good reservations because so many Europeans will be flocking there at the same time. The War is much more etched in memory there than it is here. So we are going in March or April. So thanks to everyone involved in this effort. The restoration is long overdue, because there’s part of me that will miss the dust, dirt and old glass frames protecting the displayed items because these gave the displays a sense of timelessness that that adds to the visit. Hi @Bob. I noticed the same about WWI, but there’s a good reason for it. The War Memorial was built as an original component of City Hall when it was built in 1932, and WWI was the last conflict that American forces had fought in up to that time. In a related/unrelated note, my sister’s husband is Belgian and grew up not far away from Flanders Field. We all visited the American Cemetery there a few years ago and it was one of the most moving experiences of my life. Belated Congratulations to Chris and David Hoover for focusing attention on this City treasure. As a city employee, public official and City Hall junkie, I’ve long been a fan of the War Memorial, particularly the dioramas. I felt bad when the figure I think depicting General Polaski (?) while reviewing the troops in Valley Forge diorama had succumbed to the cold and fallen over. (He has since gotten back on his feet.) The Gettysburg diorama is a particularly vivid depiction of the “high water mark” of the Confederacy . 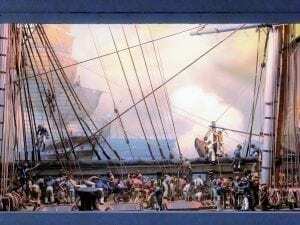 The World War I amd War of 1812 are equally well done ,but not as touching because the history of the scenes is not as well none to lay people. I was delighted to read of the plans to refurbish the War Memorail. It was designed to remind citizens of the history of the wars in which city residents had fought and died. It should remain so. The list of battles on the outside of the War Memorial should mark it for residents and passersby as well. The site should be enhanced to depict visitors knowledge of the significance of the scenes depicted and where other relevant sites in the city are located. The City should apply for designation by the Commonwealth of the site as a World War I. Visitors should be able to read posters at the site and even pick up handouts that would direct them other relevant sites. The Civil War Memorial in the Newton Cemetery should be one. \Books on the causes, conduct, and effects of the War should be listed in the Memorial and lists made available on City web sites and in the Library as well as City Hall. They should include books on specific battles (“To Conquer Hell” on the battle of the Meuse-Argonne where my great uncle died is one example. The battle is listed on the front of the War Memorial). Books like “The Vanquished”, “:Bloodlands”, and “How Could This Have Happened?”” could educate readers on the horrible truth that “the War to End War” was a major cause of World War II and the Holocaust. The War Memorial should also have maps of other relevant sites in the City like the “Great War Memorial” at High and Pettee Streets in Upper Falls and the World War I Flagpole in Newton Centre. Perhaps the city could even boost a series of events on Veteran’s Day reflecting its origin as Armistice Day marking the end of World War I just as Memorial Day began as Decoration Day after the CiviL War. Post 440 did a splendid job with its Veterans Day observance but more of the city should be drawn into the commemoration. I hope that Chris will keep us aware of the progress of the Committee working on the restoration of the War Memorial.